Expectation is the theme running through this rewarding collection of stories: an episode of subtle threat, two ghost stories, and afternoon of a frightened child, a love affair, and nine other tales. A German student spends a summer with the English aristocracy. The slow ripening of the countryside under the sun conceals deeper conflicting changes – ostensibly the family have scarcely noticed their own decline, but through the visitor’s eyes we see that time and reversal of the old order have played their part and nothing can stay the same. 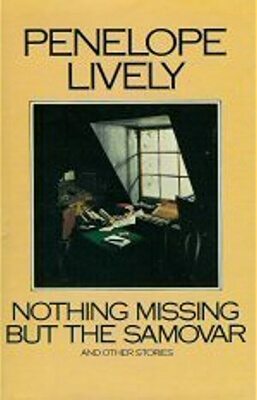 Nothing Missing but the Samovar won the 1978 Southern Arts Literature Prize. "Thank goodness for Penelope Lively! Her new book shines brilliantly; her first adult novel established her as a writer of subtlety and compression…these stories strongly underline her talent." "The 14 stories are linked by a pervading sense of menace, a feeling that everything that really matters is on the edge of going wrong – love, children’s security, the touch of the supernatural."